Photograph showing Ralph MacCarl in MacCarl Hardware. This photograph appeared in the October 10, 1984 issue of the Oshawa-Whitby This Week accompanied by a story on MacCarl Hardware by Paul Rellinger. MacCarl Hardware was located at 113 Brock Street South. Walter MacCarl worked as a clerk in the store when it was owned by Fred Maundrell. In 1927, MacCarl became a partner with then owner, W.A. Holliday. MacCarl purchased the store outright in 1939. 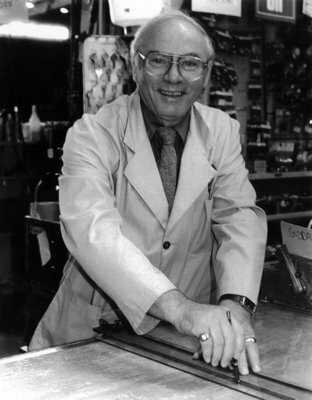 After working as a clerk in the store for many years, Walter's son, Ralph purchased the store in 1967. He retired in 1984 and the store was closed. Ralph was born in Whitby on February 16, 1924. He served for two years in the Royal Canadian Air Force during the Second World War. Ralph married Doreen Hutcheson on June 4, 1949 and the couple had two children. Ralph died at Oshawa General Hospital on July 4, 1996. Original is owned by donor.